I have this strange little affection for beets. I haven’t always, mind you. Yes, I was once was in alliance with the beet haters of the world & I, too, thought they tasted a bit like dirt. In fact, I absolutely despised them. Yet, somewhere along the lines of an expanded palette, matured taste buds, & a forced willingness to comply with the steady CSA supply, I learned to love them. Nowadays, I’d rather say they taste “earthy.” It’s a bit gentler, don’t you think? 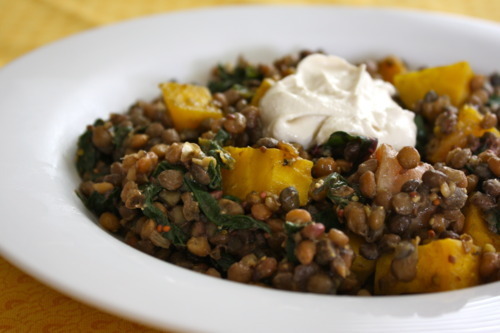 This salad was inspired by Anna’s marinated beet & lentil salad that I love so, so much. Again, I used my favorite Trader Joe’s lentils, steamed some organic golden beets from my CSA, sautéed the beet greens with a bit of red onion, & made a vinaigrette using Molly Wizenberg’s “1-3-5 part rule,” but with a special twist: black currant balsamic vinegar. If steaming beets & making dressing seems like too much effort, here’s a little secret: TJ’s makes a marinated beet salad that works perfectly with the ready to eat lentils – just combine & serve, warm or cold. For the lentils: if using TJ’s, steam in the microwave or heat stove top. If using dry lentils, prepare according to package directions. 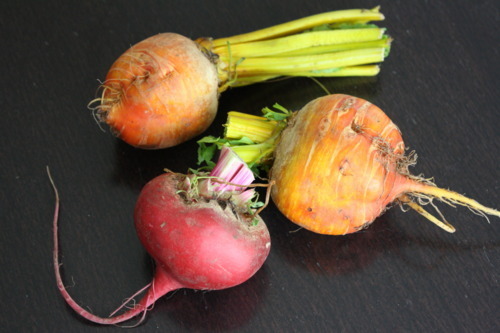 For the beets: Separate the beetroot from the green tops leaving about ½ inch of the stalk. Reserve the greens. Wash the beets thoroughly & place them in a steamer basket in a single layer. Add 2 inches of water to the steamer and bring to boil. Place the basket in the steamer pot, cover & steam at a rolling boil until the beets are tender, about 30-40 minutes, depending on their size. The beets are done when they can be easily pierced to their center with a sharp knife. Plunge beets in cold water, & slip of the skins when they are cool enough to handle, but still warm. For the greens: Wash & chop the greens, set aside. Heat 1 tsp. oil over medium heat in a large, heavy nonstick skillet. Add the onion & cook until translucent, 3-5 minutes. Stir in the greens. Stir for a couple of minutes, until the greens are nicely seasoned & wilted. Season with salt & pepper, remove from the heat. For the dressing: Combine the mustard & vinegar in a blender & blend at medium speed for about 15 seconds. With the machine running, slowly drizzle in the oil. 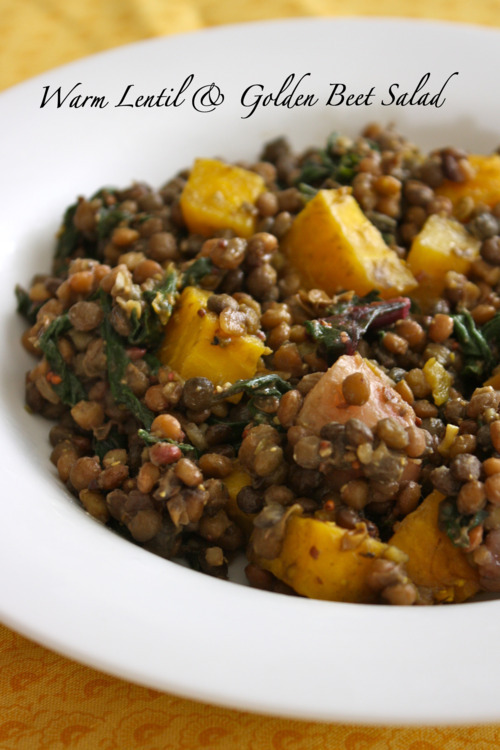 To make the salad: toss the lentils, beets, & greens with vinaigrette & serve warm. I used to love a bit of feta to goat cheese added to a lentil salad, & while I can live with out it, I do crave the creamy bite from time to time. I think cashew goat cheese would be wonderful here. I didn’t have time to make any, but I did have a freshly whipped up jar of “Cashew Crème Fraîche” from the Candle 79 Cookbook, intended for another dish I am planning on making this week. 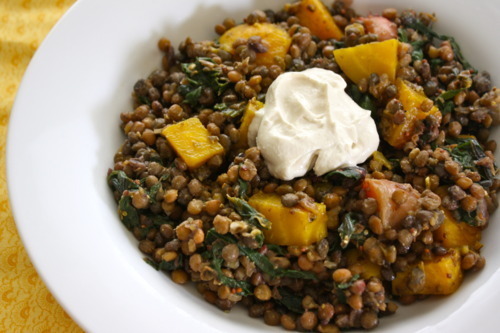 The tangy dressing was wonderful mixed with the hearty lentils, & tender beets & greens. The dollop of cashew crème craîchegave the salad that extra bit of creamy goodness I was longing for. This would make a fantastic summer picnic or potluck dish. Enjoy!